Rollin' down the river with Proud Mary and her krazy krewe! : Finally! 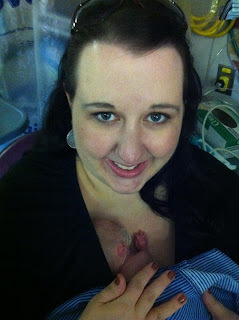 Today I woke up and got ready and headed to the NICU around noon. I figured noon was a safe bet for a time because sometimes they are still rounding when I go at ten. So I get there and try to get buzzed in only to be told the doctor JUST got there and is doing rounds, it would be at least another hour. REALLY? I was so upset considering the last visit I had I was there for 5 minutes before they had an admit. It's so hard having to obey by rules when you want to your see your own child. Grr. I had to leave because Clint had plans with his friend Zaz that afternoon so I had to go and be with Noah. Luckily Clint was back before the shift change in the NICU and my mom was feeling better so she was able to watch Noah so Clint and I could go together. We haven't been able to go together in about a week so this was a real treat. Clint actually went earlier with Zaz and Liam had a brady (bradycardia) so I was hesitant to take him out and hold him but I just couldn't stand not to since it's been days since we have cuddled with each other. Before I held him the respiratory therapist had to take some blood. I've never been there when they had to do any tests on him so I was a bit interested. However hearing his little cries were heart breaking! I just kept on rubbing his back telling him his mommy was there and that everything was OK.
Liam did VERY well with kangaroo care. Yahoo! They had to adjust his oxygen a few times but overall he did great. It was much needed for me and I'm sure it was beneficial for Liam as well. It was well worth the wait. I can't wait to do hold him next!